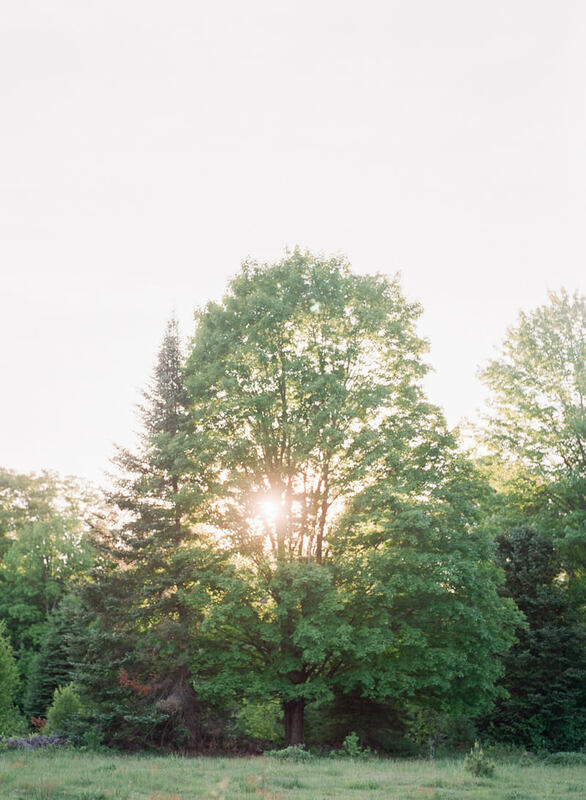 Haliburton Ontario Wedding Inspiration. In the bucolic countryside of Haliburton, Ontario, Canada, this styled shoot combines the serenity afforded by an afternoon spent in nature and the affections of a bride and groom. It’s a picture of classic romance with the spirit of the country. The first half of the shoot presents a more formal, ceremonial side. The bride’s bouquet is a simple, no frills collection of petite white flowers such as roses, lily of the valley and baby’s breath, along with assorted greenery that boasts texture and size. Her hair and makeup accentuate her natural features, with her long locks braided away from her face as she shows off the details of her lace-inspired gown. The groom is strikingly handsome in nothing more than a white button down shirt and dark brown pants. And together, they make a gorgeous pair as the sunlight moves in behind them. The second half of the shoot highlights the excitement and joy after the ceremony, where a couple can take a deep breath and enjoy the space around them. The sunlight begins to dip below the trees and golden rays shoot in between the branches. The bride lets her hair down and changes into a short dress with a beaded highlight at the waist. 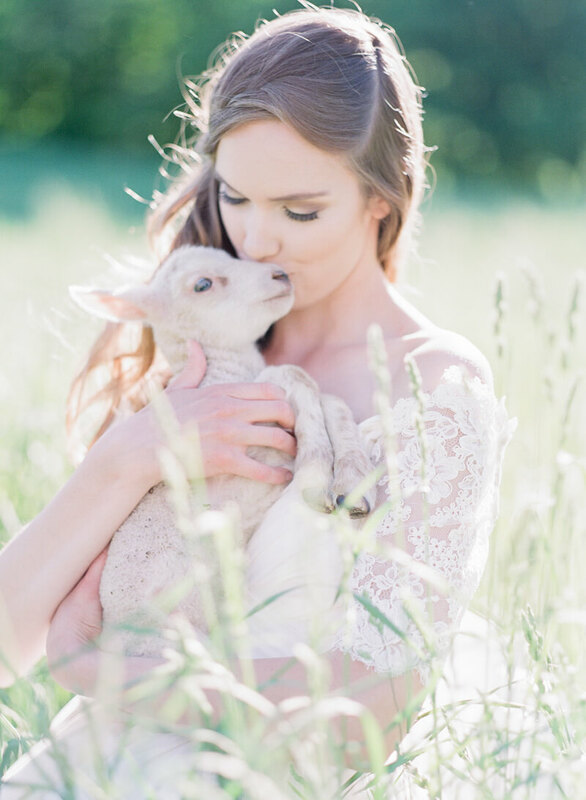 Together, they immerse themselves with the outdoors by sitting on the tall grass and finding a lamb in which to cuddle. A small hen house in the woods becomes a great spot to explore. The bride and groom walk inside and greet a small chick - a moment all parties involved are sure to remember. Finally, as they open the shutters and look at each other, their expressions say it all. You don’t always need a venue from which to host your wedding. As long as you connect with the location – big or small, luxurious or low-key – that’s all you need to bring out the best for your big day. 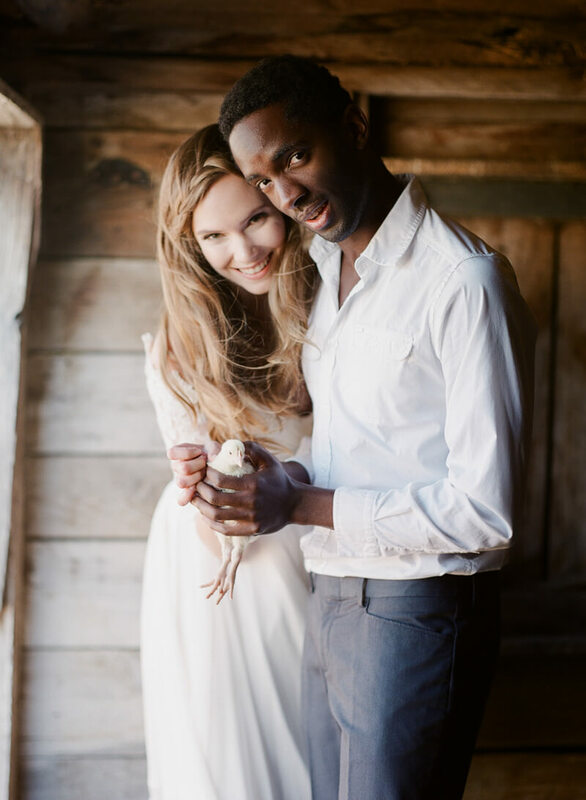 This styled shoot in Haliburton, Ontario, is an idyllic combination of all things simple, sweet and scenic.